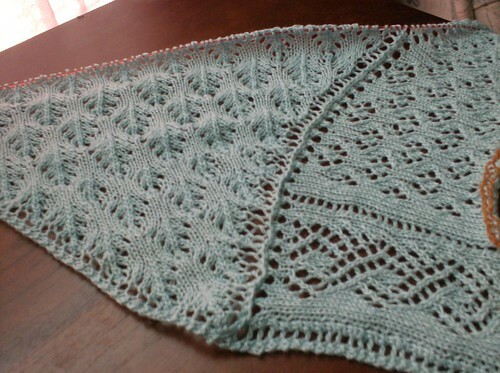 My main 'interesting' project (ie, not stockinette) is the Wings of a Dream shawl. I plan on wearing it to my cousin's wedding in September, and as the date approaches I'm working on it more and more. I just went shopping for the top and skirt I'll be wearing with it -- I'm getting very excited! The shawl is progressing nicely. I'm about halfway* though the first wing, and the pattern is getting "easy" for me. Easy doesn't mean I'm not looking at the chart... But I can knit it in front of the TV, glancing at the chart at the beginning of each new row. *'Halfway' as far as length goes. As far as stitches, the number of stitches increases each row so I have a lot more knitting ahead of me. I adore this shawl, and I can't wait until it's all done. The cashmere-silk yarn is so soft, and it should get even softer after I wash and block it. It is absolutely gorgeous. I can't wait to see how it looks when it is finished! I am so in awe of your knitting skills and can only hope that some day I'll be accomplished enough to take on knitting a pattern like this.